Coding errors in accounting entries result in an extremely time-consuming review process, which can still lead to material misstatements on financial statements. These errors often go undetected, so organizations need to take preventative measures to reduce these incidences. With Sage Intacct, one proactive method is to properly configure “dimension relationships”. One of the greatest strengths of Sage Intacct is its dimensionalized General Ledger, which allows companies to track various dimensions at the line item level. Examples include legal entities or locations, departments, projects, or even restricted funds in the not-for-profit world. However, these are not merely static values, but can be set up to interact with each other—Intacct can even require certain dimension coding on specific GL codes. For instance, maybe all revenue and expense GL codes require a department code to also be captured whenever that GL account is used. This data capture requirement leads to ability to produce department-based Income Statements. But what if this isn’t enough? Consider the following scenario: what if certain departments should only be used by certain entities/locations? If your organization is using an older, on-premises system, you may not have this capability at all! Thankfully, Sage Intacct provides the mechanism to create these “dimension relationships” directly in the platform. From a high level, there are two different types of dimension relationships in the system: the first allows for an auto-populated default value whenever a specific code is used; the second will filter a dimension list based upon a previous selection. It is common in the not-for-profit world that organizations must track restricted funds—whether it’s donations, fundraising or grant moneys, etc. For a given organization, over 90% of funds might be ‘Unrestricted’. To easily conform to this requirement, a dimension relationship could be set up between GL account and restriction—so that each GL code auto-populates to the ‘Unrestricted’ designation. The end user who is inputting this transaction will also have the ability to override the auto-populated value as needed. 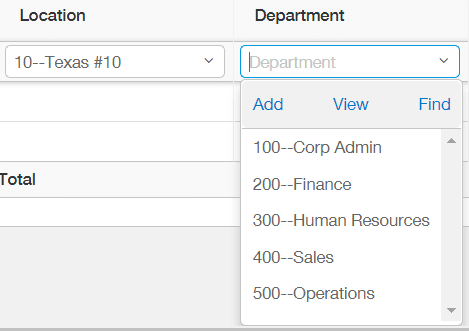 Next, consider an entirely different way to utilize the same concept of dimension relationships within Sage Intacct. Here, our use-case is that some departments should only be used by certain locations. 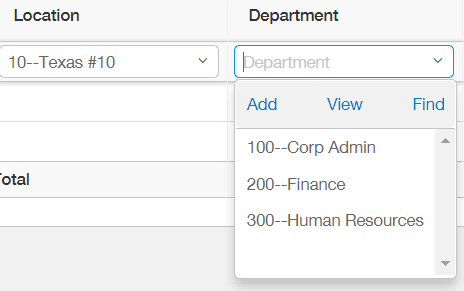 In this scenario we would want our department codes list to be automatically filtered once a given location was selected. Note the differences in the two screenshots below. Dimension relationships can be configured between any dimension in the system, even user-defined dimensions and GL accounts! They can be a powerful tool to ensure good data is being captured and can eliminate risks for coding error which negatively impact the financial statements—all while saving users’ time as they code their entries. The key is understanding which dimension relationship is right for you. We strongly recommend consulting your implementation experts before attempting to configure these dimension relationships. If you need any help along the way, we’re more than happy to assist. You can contact us here to speak directly with a team member from SC&H Group’s Accounting Solutions practice.